Scroll right to the end for a lovely video from the staff at the W.F.P to all involved. What would you say if I said, you had the power to make an enormous difference in this world? This is the message I have been sharing with virtually each and every new person I meet. I imagine you wish you had some ear plugs in your back pocket when you see me walking through the door. Based on the strength of this message, a group of food bloggers and myself held a series of meals during the month of August, based very much on the first one I held and you can read about that here (scroll down in that post for the video we made). The aim was to educate ourselves and our friends (read: anyone who’d listen) about the hunger crisis and more importantly to discuss viable steps that we, as mere mortals can take to make some sort of difference, such as donating via the W.F.P’s WeFeedback site and spreading the message that every contribution counts. Each of us had a different audience, with different perceptions. Simone held her lunch in Almere, in the Netherlands. Jenn, a U.S expat, held her’s in Switzerland, Astrid held her dinner in honour of her Mom’s birthday with her family in Vienna, Austria. Fritz held his 3 sitting steak braai in the northern suburbs of Cape Town and I hosted a dinner for 10 in the Southern Suburbs of Cape Town (a summary of everyone’s meals as you scroll down). Our aim was with each meal that 500 kids ( at a cost of ZAR 1000 or 100 euro) would be fed via the Wefeedback model, which feeds children at schools in the most disaster stricken areas around the world. The premise for our project being, 1 food blogger, 1 meal, 500 kids fed. After all the meals, we were able to feed 5452 children and raised $1363 (ZAR 9541)!! Keep in mind it costs just 25 US ¢ (ZAR 1.75) fo feed one child one cup of nutritious food.An enormous and heartfelt thank you to superstars Fritz, Jenn, Simone, Astrid and everyone who attended and supported us. 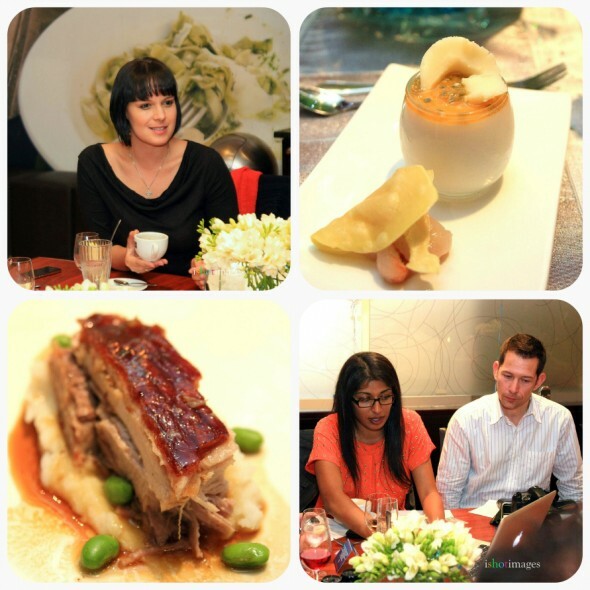 Will you, as a food/wine blogger, writer, reader and lover join us? Host your own meal in aid of Wefeedback. It really can be as simple or elaborate as you wish. If you’d like to donate, pelase join our network here. Thank you for joining us at this WeFeedback Blogger Dinner! You are here to support a global food blogger initiative aimed at bringing your attention to the realities of the hunger situation we are facing today. You know about the crisis in the Horn of Africa, for example. But what can you do about it? Read on…. www.wefeedback.org is the incredible, interactive site developed by the World Food Programme (WFP) who manage to feed 100 million people each year in the most trying of circumstances: floods, famine, war, the works. Wefeedback feeds the children that are hardest hit. This one cup of food costs you and I a mere 25 US $ c and is the reason they are in schools. You can not teach a hungry child, after all. Join the Wefeedback site, play around. Every few weeks donate your cheese sandwich. It can feed more kids than you think. It’s incredibly easy to navigate- consider it online shopping for the soul. Spread the word. To your social networks, your friends and families. If you’re a food blogger or you love to have people over, host a meal like this one – tea & cookies, cocktails, a party for 2. Use your imagination. No contribution is too small. It’s all about igniting the dialogue for change. What about hunger in RSA? Technically, South Africa does not qualify for assistance from the UN. For the GDP we declare, we should not be faced with hungry bellies. We may not have the dire problems faced in the Horn, but clearly there are people who are struggling. Find someone to give your leftovers to. Conserve resources as the climate is first to suffer. Waiting for someone, some leader, someone more powerful to change the world, is futile. That someone is you! 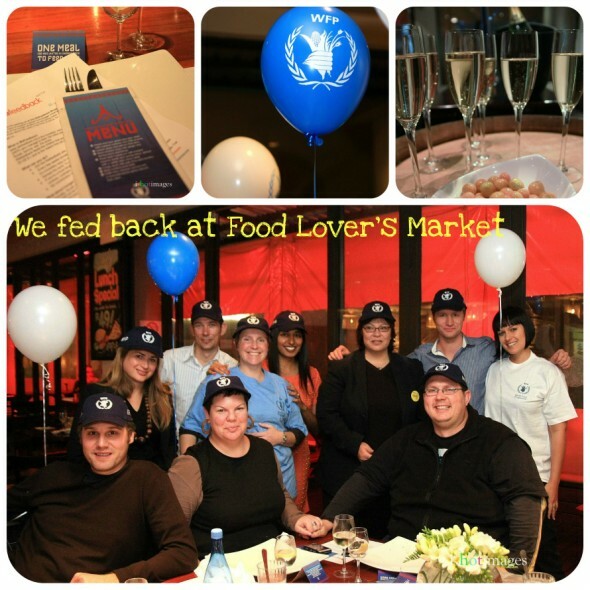 I purchased a dinner for 10 at a charity auction and the very kind people at Food Lover’s Market embraced the idea of us hosting the dinner for Wefeedback, a sort of charity trade off. The dinner marked the very first supper club held by Food Lover’s market (Cavendish branch) and Chef Kirsten of Miss K, prepared a 7 course Thai feast for us. Jean Dennis, Chef Kirsten, Maggie Mostert, Hennie Coetzee, Tracey & Patrick Miles (video), Marianna & Cameron, Jacs van Zyl, Neill Anthony, Skye Grove, Jon Meinking (photographer), my long suffering better half and everyone who read, sent messages of encouragement and retweeted our #WFBwecare tweets. It also helped that we had arguably two of the most perceptive and efficient wait staff in the entire world! Yip, I said world. Together we raised enough to feed 1200 children! A handsome sum of $300! My friend and fellow local food blogger Fritz conceptualized a steak and chip (classic South African meal) braai and was not satisfied with hosting just one. Instead, he rotated his attendees in a three sitting affair thereby maximizing the value of the large table, chairs and crockery he hired especially for the night. Might I add at this point, Fritz and his housemates have the ideal space to host barbeques. We even sat around an open fire outside and came very close to singing Kumbaya (I stole that little nugget from fellow attendee, my pal Neill). Fritz had negotiated with sponsors and introduced amazing prizes, which he craftily raffled off to everyone. 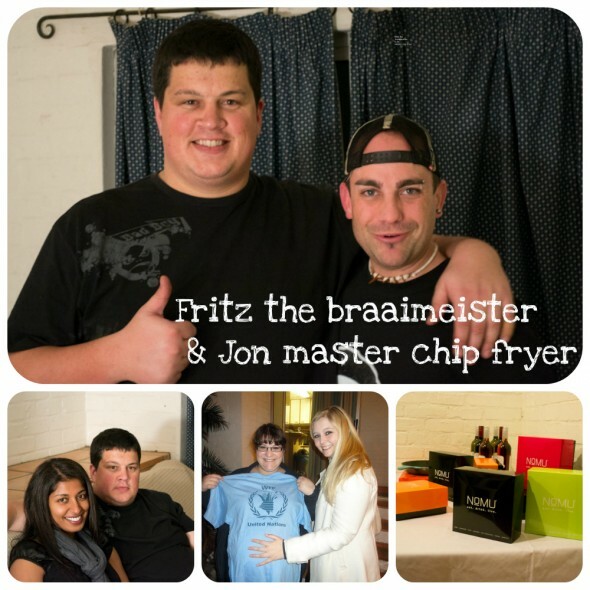 Thanks go to Fritz for not just embracing the idea but going super large with it, Jon Meinking (master chip fryer and photographer), Andre Pentz (wine and braai stand sponosrship on behalf of Rib Shack Red Wines and chief money collector), NoMu, Le Creuset and all of Fritz’s 30 guests and out twitter supporters. 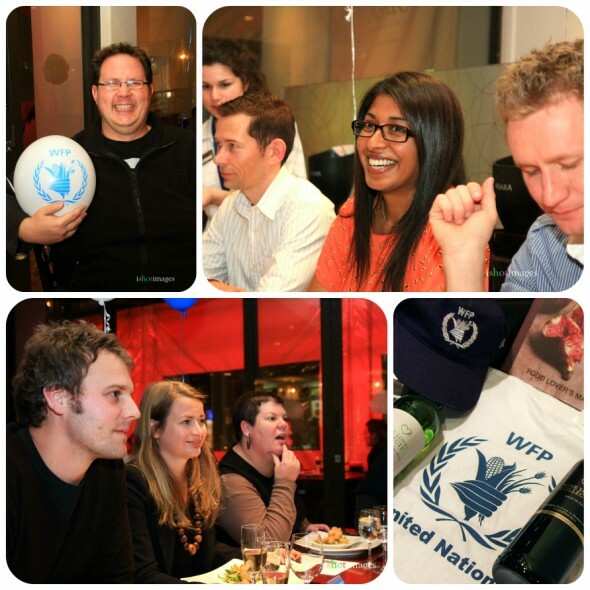 Later that night we were thrilled to discover #WFBwecare was trending in Cape Town. Silly and small, but it made us happy. At the end of the night, Fritz fed 2752 children and raised almost ZAR 5000 ($688)!! P.s I tried, but failed at wrestling that sublime marinade recipe from Fritz. Guess he’s going to have to have another braai for us soon. Simone and her best girl friend, had an intimate catch up lunch at one of their favourite Thai restaurants and shared images of their spicy beef with green beans and starter platter. Simone shares her view on hunger, giving back and Wefeedback here. 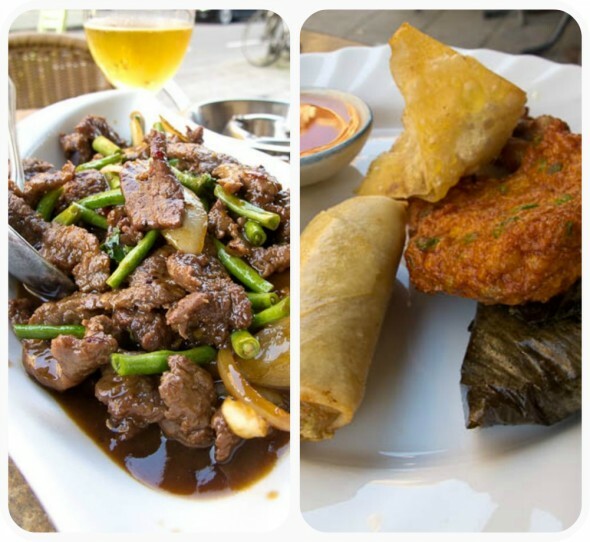 If you don’t read her English or Dutch blogs on food, you are truly missing out. Simone is both a wonderful writer and a gifted photographer of food and other subjects. She mentioned that the images she took of her meal were with her compact camera. Please have a look at her styled studio shots on her blog. 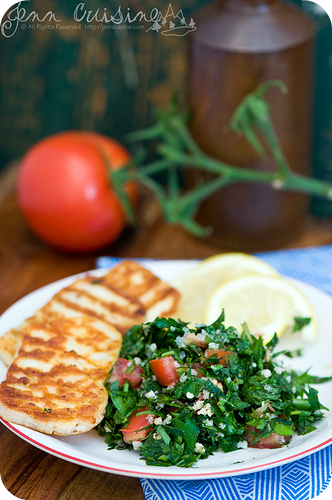 Jenn shared her meal of herbed tabbouleh and grilled halloumi with her fellow scientist husband and they enjoyed it outdoors, making the most of the sunshiny weather in Switzerland. Jenn shares her thoughts on hunger and Wefeedback here and I encourage you to read her post as well as her gluten free blog filled with beautiful, achievable recipes and outstanding photographs. I will update this blog with Astrid’s post soon. If you would like to join our network and host a meal of your own and need information, please contact me on the blog or at ishay@gylc.co.za. Sincerest thanks to Justin and Claudia of W.F.P for couriering a box of splendid goodies to Fritz and I in record time and for your constant support, even in the most hectic of times. Alas, I fiddled with the setting and lost the hundreds of likes/retweets/shares, as generated by exposure on the World Food Programme’s & Wefeedback’s Facebook pages as well as mention of our projects as the headliner in the monthly email sent out by the WFP. Thank you. This beautiful video made by staff at the W.F.P to say thanks – we’re blown away with your kindness. Thank you! Great post! Please let me know exactly how one of those dinners work…how do you collect money from hosting a dinner? Lovely post Ishay! It was a real pleasure being part of this and I’m sure more to come in the future! Thanks for getting involved Simone- and yes, to many more! WOW. This is touching to know that so many people care and give back. Life is all about balance and if you give back sincerely you will receive. You are an inspiration :)) Well done to all who took part in this – and how lovely to see the pic of you and J :)) Miss you! Thanks Jeanne. If you were in Cape Town, you’d have been dragged to the dinner 🙂 Miss you too. Thanks Minglet and for always listening and giving insight. 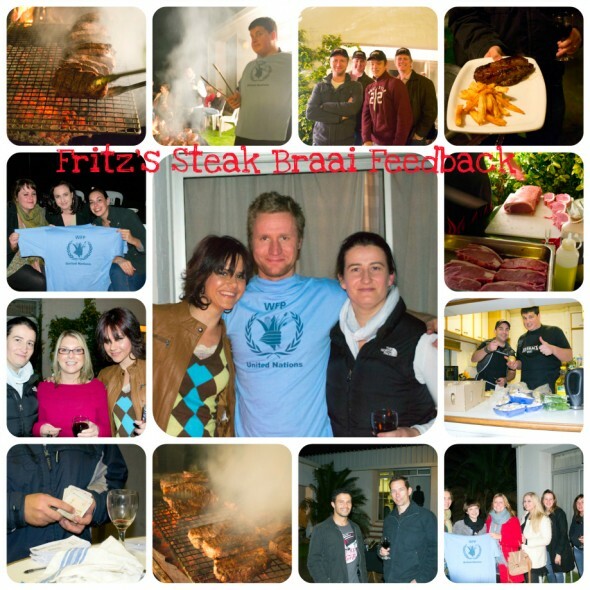 ishay, this is an incredible initiative, and I’m so sorry I wasn’t able to make Fritz’s steak-off! Incredible, and well done you lot! Thanks Polka. there will be others and hope you will join when you can.